Joseph M. HOLLINGSWORTH [Parents] was born about 1876. He died on 24 Jun 1963. Joseph married Estella May LONG on 26 Sep 1900. Estella May LONG was born about 1878. She died on 14 Mar 1904. Estella married Joseph M. HOLLINGSWORTH on 26 Sep 1900. Jacob SHIPMAN was born in , , North Carolina. He died on 12 Sep 1849 in , , North Carolina. Jacob married Charlotte BIRMINGHAM on 14 Jul 1814 in , Anson, North Carolina. Charlotte BIRMINGHAM was born in 1790. She died in 1880. Charlotte married Jacob SHIPMAN on 14 Jul 1814 in , Anson, North Carolina. M i Charles B. SHIPMAN was born in 1826. He died after 1880. Milas Frank CARLISLE [Parents] died on 2 Dec 1898. He was buried in Mills River, , North Carolina. Milas married Carrie E. MC MINN on 12 Apr 1896 in , , North Carolina. Carrie E. MC MINN [Parents] was born in 1873 in Hendersonville, Henderson, North Carolina. She died on 31 Dec 1899 in , Henderson, North Carolina. She was buried in Ebenezar Baptist Church Cemetery, Henderson, North Carolina. Carrie married Milas Frank CARLISLE on 12 Apr 1896 in , , North Carolina. M i Milas Frank CARLISLE died on 2 Dec 1898. George Pinkney MAXWELL was born in 1877. George married Bessie L. MC MINN on 22 Apr 1899. Bessie L. MC MINN [Parents] was born in Aug 1875 in Hendersonville, Henderson, North Carolina. She died on 20 Oct 1904 in , Henderson, North Carolina. She was buried in Ebenezer Cemetery, Hendersonville, Henderson, North Carolina. Bessie married George Pinkney MAXWELL on 22 Apr 1899. James "Jim" Pinkney WARD was born in 1878 in Hoppers Creek, Henderson, North Carolina. He died on 4 Feb 1939 in , Henderson, North Carolina. He was buried in Moore's Grove Methodist Baptist Church Cem, Henderson, NC. James married Minnie A. MC MINN on 20 Jan 1900 in Hendersonville, Henderson, North Carolina. Minnie A. MC MINN [Parents] was born in 1876 in Fruitland, Henderson, North Carolina. She died on 2 May 1902 in , Henderson, North Carolina. She was buried in Ebenezar Baptist Church Cemetery, Henderson, North Carolina. Minnie married James "Jim" Pinkney WARD on 20 Jan 1900 in Hendersonville, Henderson, North Carolina. F i Nora WARD was born on 9 Jun 1900. She died on 10 Dec 1932. James Albert "Ab" MC MINN [Parents] was born in Mar 1878 in Fruitland, Henderson, North Carolina. He died in 1915 in , Henderson, North Carolina. He was buried in Old Locust Grove Cemetery, Henderson, North Carolina. James married Susan Grace GENTLE in 1903 in , Henderson, North Carolina. Susan Grace GENTLE [Parents] was born on 7 Jan 1888 in , Henderson, North Carolina. She died on 5 Jan 1971 in Hendersonville, Henderson, North Carolina. She was buried in Locust Grove Cemetery, , Henderson, North Carolina. Susan married James Albert "Ab" MC MINN in 1903 in , Henderson, North Carolina. Sidney MC MINN was born in 1904 in , Henderson, North Carolina. He died in 1905 in , Henderson, North Carolina. He was buried in Old Locust Grove Cemetery, , Henderson, North Carolina. F ii Lola Mae MC MINN was born in 1906. She died on 8 Mar 1924. F iii Roseltha Mae "Elthie" MC MINN was born on 21 Apr 1908. She died on 29 Sep 1996. M iv William Glenn MC MINN was born on 6 Oct 1910. He died on 29 Jul 1989. Arvil MC MINN was born on 19 Jul 1914 in Hendersonville, Henderson, North Carolina. He died on 19 Jul 1914 in Hendersonville, Henderson, North Carolina. He was buried in Old Locust Grove Cemetery, , Henderson, North Carolina. M vi James Therlo MC MINN was born in 1923. He died on 24 May 2006. M vii Carroll Robert MC MINN was born in 1926. He died in Nov 2013. Newton Marion GENTLE [Parents] was born on 3 Nov 1866 in , Henderson, North Carolina. He died in 1905 in , Henderson, North Carolina. He was buried in Locust Grove Baptist Church Cemetery, Henderson, North Carolina. Newton married Hulda Ann STEPP in 1887 in , Henderson, North Carolina. Hulda Ann STEPP [Parents] was born on 29 Apr 1871 in , , South Carolina. She died in 1904 in , Henderson, North Carolina. She was buried in Locust Grove Baptist Church Cemetery, Henderson, North Carolina. Hulda married Newton Marion GENTLE in 1887 in , Henderson, North Carolina. F i Susan Grace GENTLE was born on 7 Jan 1888. She died on 5 Jan 1971. Metta Elizabeth GENTLE was born on 27 Mar 1891 in Hoppers Creek, Fletcher, Henderson, North Carolina. She died on 1 Dec 1982 in Hendersonville, Henderson, North Carolina. M iii Charles Marion GENTLE "Sr" was born on 27 Dec 1893. He died on 9 Apr 1961. Lavadia GENTLE was born in 1895. She died in 1895. She was buried in Locust Grove Cemetery, Henderson, North Carolina. Robert Sidney MC MINN [Parents] was born on 10 Dec 1884 in Hendersonville, Henderson, North Carolina. He died on 19 Jun 1975 in Saluda Nursing Center, Polk, North Carolina. He was buried on 22 Jun 1975 in Locust Grove Cemetery, Henderson, North Carolina. 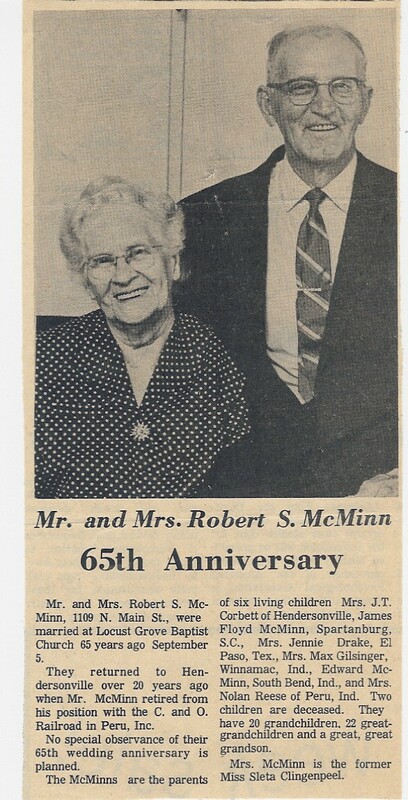 Robert married Sleta Mae CLINGENPEEL on 3 Sep 1905 in Log Locust Grove Baptist Church, , Henderson, North Carolina. Sleta Mae CLINGENPEEL [Parents] was born on 1 Jul 1887 in Greeneville, Greene, Tennessee. She died on 3 Jul 1978 in (Hoopers Creek Twp) Hendersonville, Henderson, North Carolina. She was buried in Locust Grove Baptist Church Hendersonville, Henderson, North Carolina. 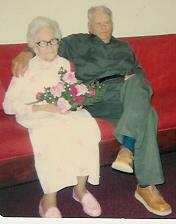 Sleta married Robert Sidney MC MINN on 3 Sep 1905 in Log Locust Grove Baptist Church, , Henderson, North Carolina. F i Stella Lavina MC MINN was born on 13 Jun 1907. She died on 5 Nov 2004. M ii James Floyd MC MINN was born on 18 Jul 1909. He died in Jun 1976. F iii Jennie Josephine MC MINN was born on 3 Nov 1911. She died on 11 Jul 2008 from Congestive Heart Failure. Lillian Mae MC MINN was born on 23 Feb 1913 in Woodruff, Lawrence, South Carolina. She died on 29 Dec 1913. F v Lee Nora "Pinky" MC MINN was born on 13 Aug 1915. She died on 15 Dec 1995. M vi Clarence Edward "Ed" MC MINN was born on 17 Aug 1918. He died on 27 Jun 1990. M vii William Lowell "Bill" MC MINN "Sr" was born on 26 Feb 1921. He died on 17 Feb 1970. M viii George Robert MC MINN was born on 28 Feb 1923. He died on 14 Mar 1945 from WWII War Casualty . Thurman B.l MC MINN was born on 27 Oct 1925 in Peru, Miami, Indiana. He died on 27 Oct 1925 in Peru, Miami, Indiana. F x Clara Jane MC MINN was born on 9 Jul 1929. James B. BLYTHE "Sr" [Parents] was born about 1730 in , Bertie, North Carolina. He died in 1803 in , Buncombe, North Carolina. James married Ruth. Ruth was born in 1754 in Of, , , Tennessee. Ruth married James B. BLYTHE "Sr". F i Anne BLYTHE was born on 21 Mar 1771. She died on 12 Jan 1837. Rev. James B. BLYTHE "Jr" was born in 1774 in , , Virginia or Tennessee. He died about 1819 in , Buncombe, North Carolina. M iii Rev. Jesse BLYTHE was born on 3 Mar 1775. He died on 7 Dec 1838. Jane BLYTHE was born about 1777 in , , Virginia or Tennessee. John BLYTHE was born about 1778. He died in 1854 in , Buncombe, North Carolina. Mary "Polly" BLYTHE was born in 1780. She died on 28 Jun 1841 in , Walker, Alabama. She was buried in Smith Cemetery, , Jackson, Alabama. M vii Rev. Sion BLYTHE was born in Jan 1781. He died on 23 Aug 1835. Charlotte BLYTHE was born about 1782. She died on 17 Jan 1849. William BLYTHE was born in 1784 in , , North Carolina. He died in 1818 in , Henderson, North Carolina. He was buried in Beulah Baptist Church Cemetery, Big Willow, Bowman's Bluff, NC.